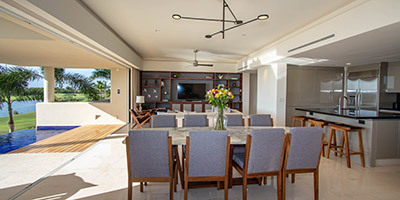 The El Encanto residential community, located within Punta Mita, is an extraordinary enclave of waterfront and golf view residences. This luxurious and spacious one level condominium occupies an entire floor and provides spectacular fairway and westerly year-round Sunset views. The floor plan features a spacious and convenient single-floor living with large terraces, one can enjoy outdoor living at it’s best. Recently finished in a contemporary and modern design with high-end finishes, marble floors, tropical quality wood throughout. This property features four bedrooms, each with a large bathroom, and good closet space. Spacious and luxuriously finished, this will make a perfect home in Paradise.